Oxford Group is the real estate development arm of the diversified Oxford Group. The company was formed in 1989 and in the years that have followed, it has consciously cultivated an approach that focuses on innovation and quality with the customer at its core. The name reflects the company's passion and vision of creating spaces which are identified as stand alone real estate developments creating a niche brand to identify with. 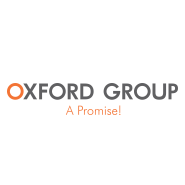 Keeping the customer at its core, Oxford Group focuses on healthy, inspired living, transparency and providing value in the form of a brand that customers associate with. The results are visible today, not just in the 3 million square feet of successful development, or the fact that today Oxford Group is developing Pune's largest project with over 1000 acres under development. The company's logo exemplifies boldness reflected through the rapid growth & diversification associated through expansion into hotels, resorts, large scale townships and unique upscale high end developments. The logo is inspired from a simple and significant insight that every step is a way forward and with every step a new project is undertaken with valuable cores such as extensive landscaping, creating vibrancy and energy through the introduction of amenities such as a golf course or a pyramid club house as designed at Florida Estate, or the private pools offered at 6 Prabhat or the private concerige lobby and infinity ozone pool at Oxford Hallmark, exhibiting each project to have a step forward in the direction of innovation, quality and the customers need at its core.